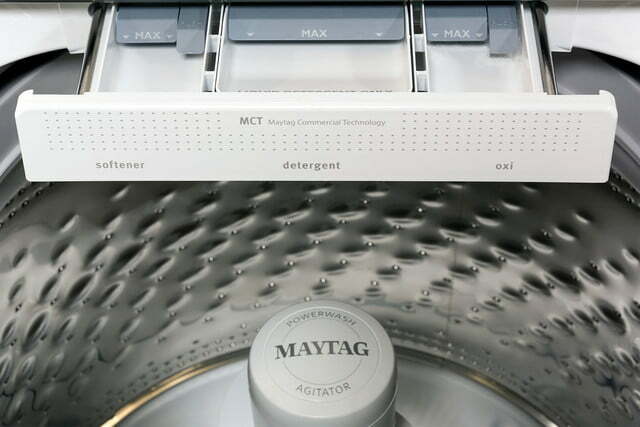 This Maytag top-loader lets you bypass its sensing algorithms for an old-school, less robust clean. Picture a generic washing machine, the Platonic Ideal of what a washing machine should be. It’s white, a rectangle, with a dial on the front, right? 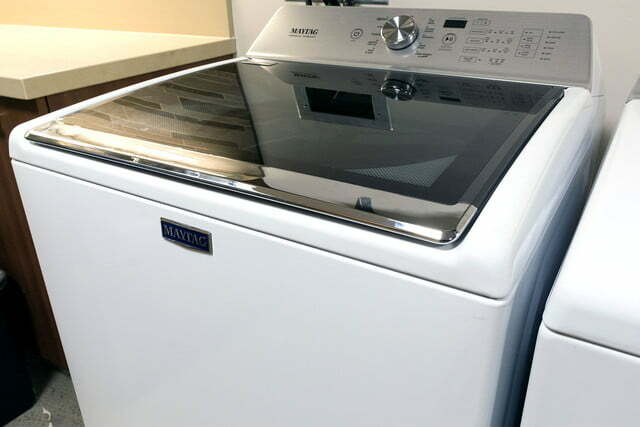 Now supersize it and you’ve got the Maytag MVWB765FW Top Loader, a 4.7-cubic foot washing machine with a huge soaking tub that can handle a ton of laundry. Think laundry for the entire family – when it’s Thanksgiving and the entire extended family is staying with you. Signature modes including PowerWash and Deep Fill set it apart as well. But there are some features that seem there more for peace of mind than actual cleaning capabilities. 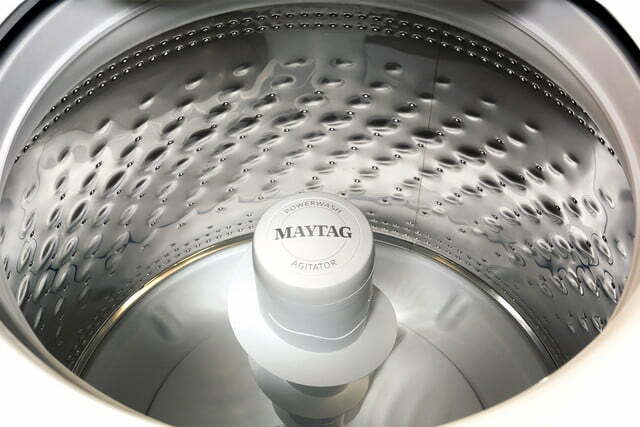 For typical day-to-day loads this Maytag does a good job; we just wish the loads didn’t take so long to complete. A departure from some of the more colorful washing machines available, this white Maytag Top Load Washer appears fairly non-descript at first glance. The control panel tells a different story, however, with multiple setting options, a digital timer, and a large play/pause button to start loads and put them on temporary hold. It’s a bit more modern than the standard washing machines you’d typically find at a rental property. While the machine doesn’t boast about its fingerprint resistance, the metal panel remained fairly smudge-free. 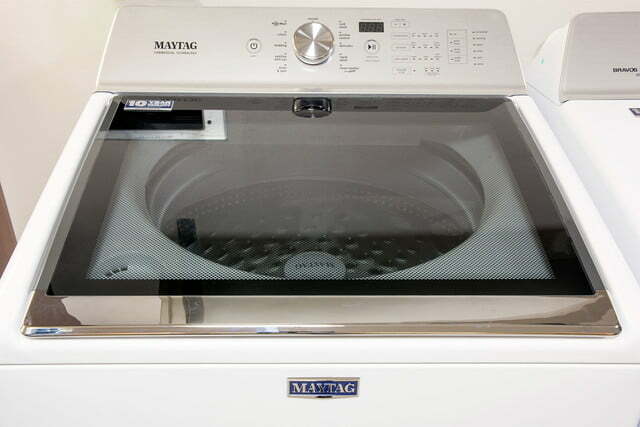 The Maytag boasts a capacity of 4.7 cubic feet and measures 42 by 27.5 by 27 inches (height, width, depth). It’s big enough to handle heavy loads, and those on the shorter side should still be able to retrieve items from the bottom of the bin. The detergent holder is a bit hidden, but easy to reach. It’s tucked away under the lid; simply pull it out and add fabric softener, HE detergent, or an oxi cleaning product in the allotted dispensers. You can add liquid bleach in the small circle dispenser at the lower left corner of the machine when the lid is open. The drum is stainless steel, so it’s built to last. Inside the drum is an agitator, a feature missing from high-efficiency top-loaders. The deep fill is for those looking for a “traditional” washing experience. The washing machine settings on the top span from the middle to the right, with lots of options. 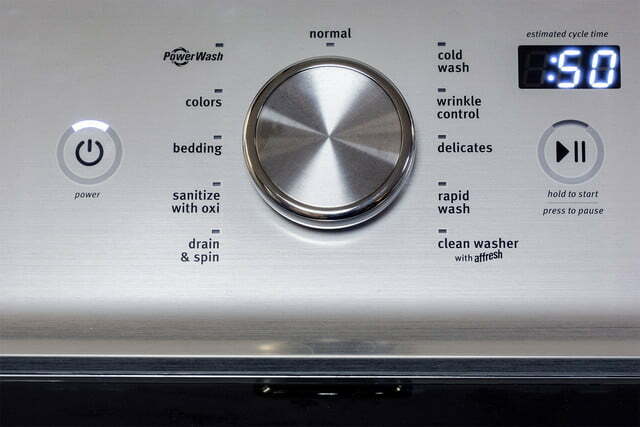 In the middle of the control panel is a knob for choosing the type of wash you want. Options include drain and spin, sanitize with oxi, bedding, colors, PowerWash, normal, cold wash, wrinkle control, delicates, rapid wash, and clean washer with Affresh. You’ll notice there’s no setting for Whites. Between the other options available, you can create your own option for handling them, though. You can fine-tune your selection by choosing water temperature, soil level, spin speed, deep fill (on/off), oxi, extra rinse, and deep clean. For the most part, you can mix and match all you want, except when you pick sanitize with oxi. That water is going to be hot, and the only thing you can adjust is the spin speed. You can actually over-customize: The machine is fine with letting you wash your delicates in hot water. That might be fine for experienced laundry-doers, but we can see the penitential for novice teens making a mistake or two, given all the options. You can also set the audio level of the chimes. When you first turn on the machine by pressing the power button, it emits a tune that’s reminiscent of something you’d hear in the Close Encounters movie. The far right column of options (lid locked, sensing, wash, rinse, spin, and done) illuminate to let you know which part of the wash cycle is occurring. While there is a timer, you can’t rely on the reading. To be fair, above the timer are the words “estimated cycle time.” Trust us; that’s just an estimate and you can expect your loads to take much longer. They often ran half an hour over the estimated time. 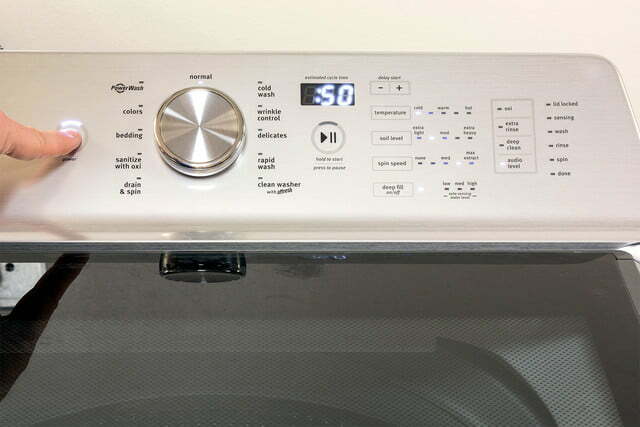 When you’re ready to wash a load, you press the Start button (it’s got an icon of the play button). The lid locks and the cycle begin. However, you can always add another item to the load by pressing the same button (it’s also got the pause icon). The lid will unlock, so you can open it and throw in that forgotten piece of clothing. The drum is stainless steel, so it’s built to last. The two big options that set this machine apart from others is PowerWash and deep fill. The PowerWash option offers extra cleaning power in heated water to remove tough stains, while the deep-fill option fills the washer to a pre-determined water level regardless of load size. 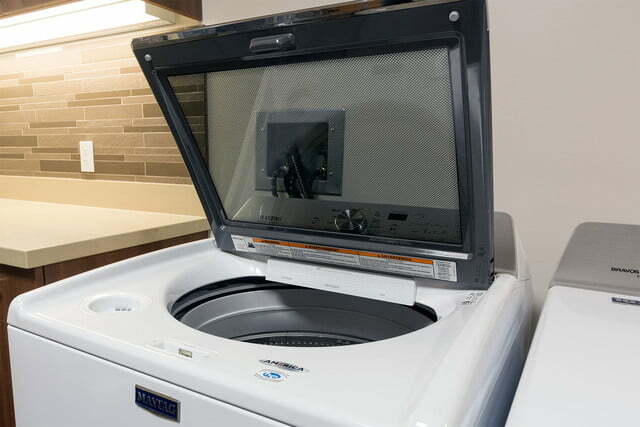 This feature – designed for those who feel modern washers don’t use enough water — is available with any cycle except sanitize with oxi, drain and spin, or clean washer. This machine has auto-sensing for the water levels, so if you don’t select deep fill it will estimate the load size and add the appropriate amount of water. 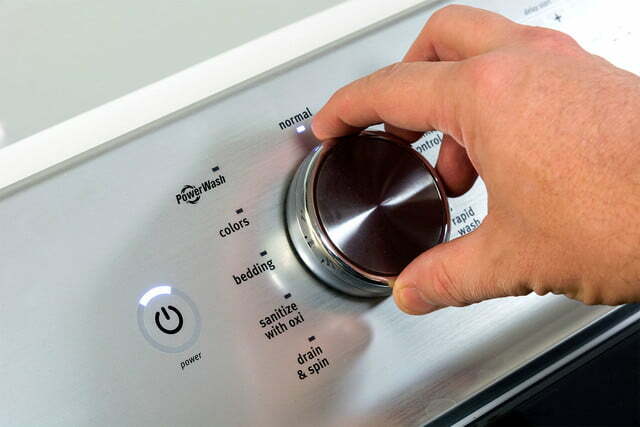 Interestingly, even Whirlpool admits that the auto-sensing is your best bet for removing stains, and the deep fill is just more for those looking for a “traditional” washing experience. The same could be argued for the presence of the agitator; many people like them because they think they get clothes cleaner, but they are definitely tougher on fabrics than high-efficiency, non-agitator models. Agitator models also tend to use more water, especially if you choose the deep-fill option. We washed a variety of loads over a couple of months and were fairly satisfied with the results. However, we couldn’t remove some stains when running a standard load. For example, we ran some clothing and a towel stained with stout beer, coffee, and soy sauce (we did not pre-treat the towel) on the colors cycle — with a temperature setting between cold and warm, soil level set between medium and extra heavy, medium spin speed, and deep fill — and there were still some faded stains on the towel. Since the PowerWash cycle is all about removing stains, we put it to the test by washing a stained chair cover and a shirt with tons of paint and oil markings. We added oxi, deep clean, extra soil level, and washed it in warm water. Many of the stains were removed; however, there were still some baked-in stains we couldn’t get out. To be fair, these were stains that have been on these items for years, and fresher stains faired much better. On this machine, the PowerWash cycle is your best bet for washing stained clothing. Just be prepared to wait awhile for the load to finish. In our tests it took an hour and 45 minutes to complete. This model comes with a 10-year limited warranty. Parts and labor are covered for the first year. The second through the tenth year of the warranty will only cover the drive motor and side walls of the wash basket. Labor is not included. For those who really want an agitator, there are still a few options on the market. 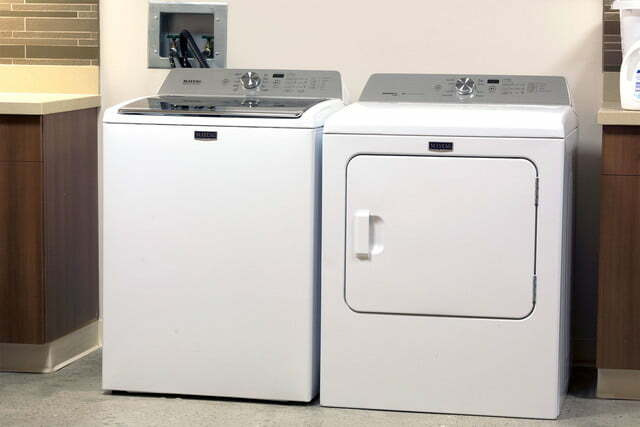 GE has one, the GTW485ASJWS, for a few hundred less than this Maytag model, though it has a smaller capacity. It is Energy Star rated, though. 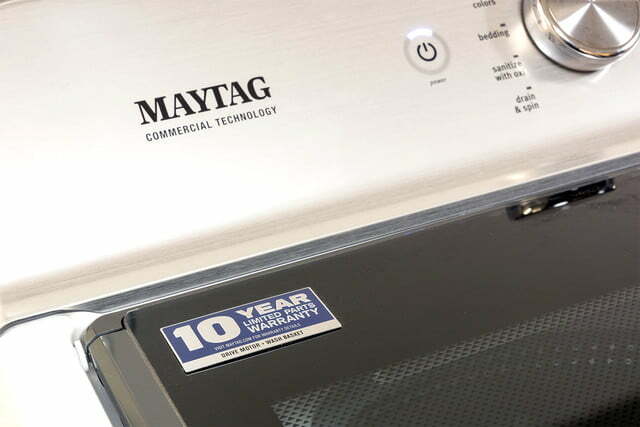 Washing machines aren’t miracle workers, but this Maytag’s stainless steel drum and 10-year warranty means it should work for years to come. That said, you’ll want to treat it right. Don’t over-pour your detergent, use the self-cleaning cycle, and don’t try to cram in too many clothes. All these habits can shorten its lifespan. This washing machine definitely has a deep tub, which is great for bedding and heavy loads. 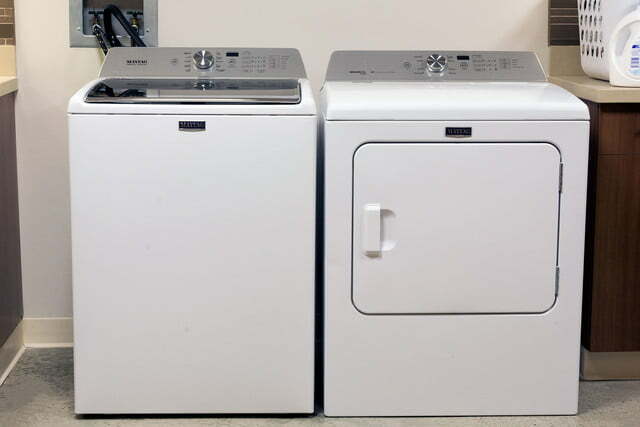 If you’re truly looking for that old-school washer feel, this is a fine choice, but a high-efficiency top-loader or front loader will likely get your clothes clean using less water and electricity.